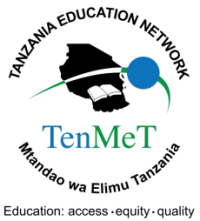 Tanzania Education Network/Mtandao wa Elimu Tanzania TENMET is a national network of non state actors in education founded in April 1999 by 39 NGOs. Members are mainly Community Based Organizations (CBO’s), Faith Based Organizations (FBOs) and national and international Non Governmental Organizations (NGOs), having a common concern of the promotion of quality education in Tanzania. The core objective is to work and link with other actors in education so as to influence policies and practices on basic education for all in Tanzania in a collective and informed manner.